Create a summer calendar with weekly themes. Check out two to three books for each topic from your local public library and prepare simple activities related to each subject. Here is a sample for an ocean theme that includes a storybookmy, music, field trip and game activity and a printable. Another useful tip is to search for storybooks on Youtube or Vimeo. I found a few options for my ocean theme and even a video for one of the storybooks I picked for my theme! Play a simple memory game to practice the vocabulary of the week. This lesson includes a FREE memory game. Just print each page twice, laminate and play! Ask your child to read out loud the name of each animal. “El tiburón y el pez no son un par” [The shark and the fish are not a pair]. Visit the aquarium. Ask for pamphlets or free educational materials in Spanish. You will be surprised of what they might offer in other languages. You can play Yo veo, yo veo [I spy] while visiting different exhibitions. “Yo veo, Yo veo un animal gris muy peligroso” [I see, I see a very dangerous gray animal ]. “¿Tu ves un tiburón?” ¡Si, yo veo un tiburón! [Do you see a shark? Yes, I see a shark!]. 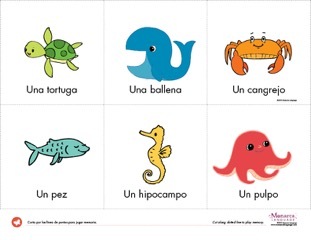 Tantos Peces by Monarca Language is a sing-along video that teaches children what is not a fish, such as octopus, whales, etc. Super cute! Summer is all about going out places, visiting friends and family and spending time outdoors. Have your children create a Pictionary en Español. You only need a sketching pad and drawing or coloring pencils. Ask them to draw and label three to five pictures each day of the things you did or the places you visited. At the end of each day, you can ask them to tell you a story or just a simple sentence using those three to five words. Your local library probably has a good amount of Spanish language music. Play it, Dance it, Sing it! Music is the perfect way to learn and practice another language. Start with upbeat, easy and repetitive lyrics; make sure to print out the lyrics of the songs you will be practicing each week. Catchy and easy to learn songs with familiar words and concepts. Most songs have videos and dance steps to learn and follow. Always keep it fun but consistent and your niños will be ready for más Español in the fall.